It’s easy to go wrong with blush if you don’t know how to use it properly. The key to getting blush right is to know what colors work for your skin tone. With the right choice, blush can add some color to your complexion, make your face pop in a crowd, and help complement other colors applied to the eyes and lips. Here is a guide to choosing your blush based on your skin tone. In general, fair skin benefits from light colors like a soft pink or baby pink blush. 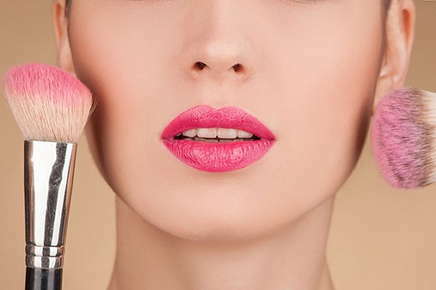 These light pinks are actually the most common blush colors for fair skin. However, other colors like peach also work well for fair skin, especially if you want your blush to stand out a bit more. For fair skin, sheer or silky blushes work best; you want an almost clear blush coat that doesn’t go on chalky or thick. Other strong colors, like bronze or anything with violet hues, should be avoided. A medium skin tone already has warmth, so you don’t have to overdo it. However, this complexion can benefit from blushes with a little more pigment like berry and rose hues. Colors like apricot, peach and orange-like colors all look great as well, especially in summer months when they offer a fresh and fun look. Try to stay away from blush with a sheer finish, greyer tones, or light pinks. The good news about olive skin is that it looks great with almost every blush color. Warm shades like bronze, violet, apricot, plum, and orange all look fabulous. Rose, which is not too light and not too dark, is one of the best colors for olive skin. Olive skin can also handle heavier color applications like those that a cream blush formula provides. Cream blushes on olive skin tones creates a fresh, almost glowing effect. Lighter blush tones, unfortunately, take on a ruddy quality, so try to avoid them. Dark skin has a lot in common with the colors that work well for olive skin. Apricots, plums, oranges, and even deep reds like brick all look great. However, you’ll want to go a few blush shades darker than other skin tones. Like olive skin, avoid light colors or colors with white undertones. When applying blush, dab a little bit of the cream formula in the hollow of your cheeks and blend carefully. The end result will be beautiful. And if you need a little professional help picking the palette that's right for you, give us a call. We will be more than happy to create an entire look to fit every occasion.